Enhancing regional health and medical preparedness, response, and recovery capabilities throughout Colorado’s North Central Region. The North Central Region Healthcare Coalition (NCR HCC) is a collaboration of health and medical partners working together to mitigate against, prepare for, respond to, and recover from emergencies through planning, training, exercising, communication, and relationship building. 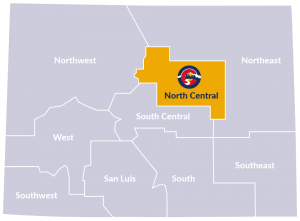 The North Central Region includes the following counties: Adams, Arapahoe, Boulder, Broomfield, Clear Creek, Denver, Douglas, Elbert, Gilpin, and Jefferson.